Modified from: Standard Methods for the Examination of Water and Wastewater, 14th Ed, (1975). pages 928-935. Students can test the drinking water from their homes, school, etc using this protocol. The health standard for drinking water allows no more than 5 coliform per hundred mL. For this reason, bacteria from 250 mL will be collected on a membrane filter, and grown on top of m Endo medium. Coliform bacteria appear as red colonies on this medium. More than 13 colonies with this assay does not meet health standards. One student in 2001 tested her tap water before and after filtration through a water “purification” device. The image shows two plates , the one on the left is tap water, the plate on the right is water filtered through the filter. Clearly the filter is contributing bacterial load to the water. These devices must be regularly changed and maintained in order to prevent such contamination. Determine the precise name of your water district, record it in your notebook. Run tap water until it is cold (to clear out pipes, at least a minute or so). Fill sterile 250 mL capped bottle with water, rinse several times, finally fill to neck, cap securely, maintaining sterility . powder into 150 mL beaker. b: Add 49 mL dH20 and 1 mL EtOH. c: Bring to boil, remove from heat immediately. 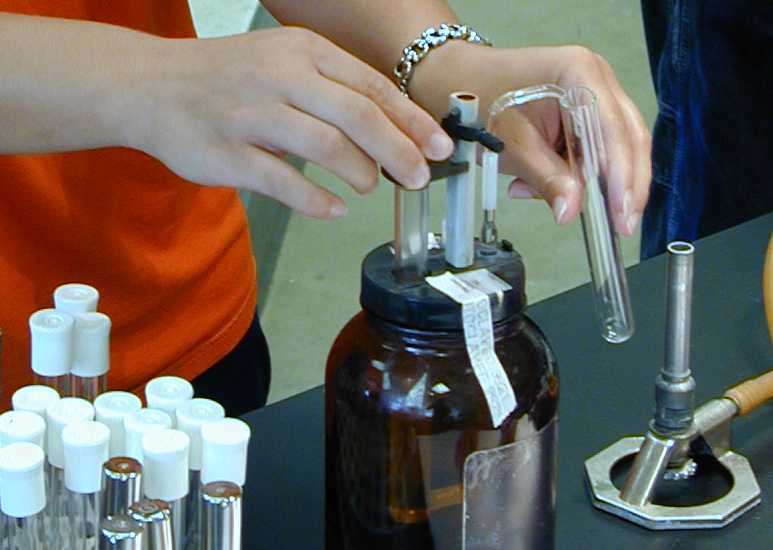 Using sterile technique, pour into sterilized repipet vessel. Securely screw down repipet to container. Clamp to ring stand for stability. Label 47 mm top of sterile petri dish with initials, seat number, date & source. Flame off EtOH from bent blade-tipped forceps, pick up sterile pad, place in bottom of sterile petri dish , replace cover. Repipet 2.0 mL m-Endo Broth sterilely onto pad , replace lid, keep bottom down. IV. SET UP PLATE: Note: Wear safety goggles, tie back hair, keep flammable materials away from flame. PRELIMINARY: Check for adequate head space in the filter flask to contain the water you are about to filter. If inadequate, empty out the flask into the sink, and replace the support platform. If necessary, re-sterilize surface of support platform with EtOH, turn on vacuum briefly to dry, then tightly clamp the main vacuum line. STERILIZE THE CYLINDER (Dangerous step): Ensure that all surfaces of the glass cylinder are immersed in 95% EtOH , pick up with fingers (touch outside of the cylinder only), invert. CAREFULLY flame off the EtOH away from EtOH beakers and other students). It will flame up fairly high, but should burn off in a few seconds. Pass quickly through the flame once more to ensure that all of the EtOH has been removed. SET UP FILTER APPARATUS: Place sterile cylinder centered over the membrane filter and support platform. Clamp in place with spring clamp , vacuum still on. Pour your 250 mL water sample into the cylinder , monitoring that it is not leaking at the clamped joint . The vacuum will draw the water through, and all bacteria which may be in the 250 mL sample will be trapped on the surface of the membrane filter. TRANSFER MEMBRANE FILTER TO PREPARED PAD , avoiding bubbles by lowering from one side first. Rest it on far edge of petri dish, slowly pull it across the edge down toward you until . . .
. . . it drops down onto the pad. centered on the pad . Ensure that the membrane is completely flat on the pad. INCUBATE the plate without inverting (pad-side down) at 35C for 24 hours. COUNT THE COLONIES: Record the total number of colonies, and the number of coliform (red colonies) . Divide by 2.5 to yield the number of bacteria per 100 mL. According to national health standards for drinking water, the number of coliform/100 mL should not exceed 5. Most chlorinated tap water will have no bacteria in 250 mL, as seen on the left membrane in the first of the nest set of pictures. TOP: tap water and “filtered” water from the same home. Note that filters must be changed regularly, or else they become “nesting” places for bacteria. MIDDLE: The two water samples shown are both heavily contaminated. Wet mount preparations are especially valuable for demonstrating motility in microorganisms. Fresh cultures must be used for maximum motility. No stain is employed since most stains kill the organisms (except vital stains). Therefore focusing is more difficult (see suggestions for focusing). If your microscope has dark field capabilities, this is ideal illumination for this purpose (use the “D” position on the sub-stage condenser dial). Alternatively, a small disc of dark paper may be placed in the center of the condenser to approximate dark field optics. Motility needs to be distinguished from Brownian motion which is due to molecular bombardment. Brownian motion occurs in all microscopic bodies suspended in water and appears as a random shimmying-shaking. Motility will be in the form of cork-screw spiraling, movement in a given direction, or tumbling in place. Wet mount preparations are also useful for giving clear images of fresh specimens under the microscope. Features which may be particulate, such as spores of fungi and ferns, and pollen grains may be best observed using this technique. CULTURES: The sample of liquid culture is place on the slide. COLONIES: Sterilely transfer a tiny portion of a single colony to the drop with a loop and suspend (be certain to allow the loop to cool before picking up specimen). For solid specimens or dry spores, transfer a small portion of the specimen with a scalpel. Lower a clean cover slip over the drop as though it were hinged at one side. First focus with the 4x objective on the edge of the coverslip. It is easier to find and focus on than the nearly transparent suspension. Find a bubble in the liquid suspension, and adjust the fine focus on the edge of the bubble. Switch to the 10x objective, repeat the careful focusing. Switch to the 40x objective, repeat the careful focusing. You should be able to discern bacteria at this power (magnification = 400x). Apply oil and examine with the 100x oil immersion lens, again using the edge of the bubble as a focusing point. At 1000x, maximize the depth of field by narrowing the iris diaphragm, and adjust the focus so that most bacteria are in focus. (Because of the depth of the water, not all bacteria will be in focus at a given point.) Illustrate the types of motility you observe. Clean up the slide with alcohol first (because it had live bacteria on it), followed by soap and water. Discard the cover slip. While computer programs can conveniently construct graphs from data, hand construction of a graph remains an important means of analyzing and appreciating the value and patterns present in data. Follow the following rules in order to produce a properly sized and accurately plotted graph. X-axis: ordinate (independent or known variable): time, added concentration, etc. Count the number of squares available for the X and Y axes, leaving at least 3 square at the bottom and sides, and 9 squares at the top. Graph-lined composition notebooks with 5 X 5 quad ruling allow for a graph of no more than 35 squares wide and 40 squares tall. a. They include the limits determined in step 1.
b. They make an adequately large graph as large as the available space will accommodate. c. They do not exceed the space available on the page. Divide the value of the range by the number of squares available along the given axis. Round up so that the first significant figure of the result equals 1, 2, 5 or 10 units per square. For example, if you have Y axis range from 0.000 to 1.212, divide the 1.212 by the 40 squares available, which equals 0.0303/square. This would be rounded up to 0.05/square. Memorize the 1, 2, 5 and 10 values per square. Other values will make plotting the data difficult, and it will cost you points when graded. The quantity zero should often be the space most to the left and/or bottom. Here is a page from a notebook illustrating the parameters for sizing a graph to a page. Draw lines for the X-axis below and the Y-axis to the left of the selected open area on the graph paper. Label each axis. Mark off the selected regular values (often every 5 or 10 squares) with a small line corresponding to units/square selected in step 2. Label each small line with its corresponding value. (Do not label every square.) Be certain to maintain linearity: all spaces must have equal value. For the first point, locate the appropriate value along the X axis and then follow that line up until the appropriate value of Y is reached. Double check that you have not shifted from the desired location, and make a small dot at the point. Draw a small circle around the point, making it easier to see, but preserving the integrity of the point. Repeat until all data have been entered. Did you include the zero point if it is a significant data point? Use squares to indicate a second data set, triangles the third, etc. If the function you are graphing is linear, carefully connect the circles by lining a ruler up with the points and drawing a line between them. (Do not violate the interior of the circles so that the value of the point will remain clear.) Alternatively, if the function is non linear, you may either connect the circles or approximate the curve plots with a “best fit” curve. Create a title which is meaningful and explicitly reflects the value of the experimental data you have graphed. Place it in CAPITAL LETTERS as the title of the page. Below the title, indicate from where the original data came with a cross reference. Be certain that the axes are correctly labeled. Label any significant break points or phases in the curve, briefly indicate their meaning, if known. Milk to be tested. Have date of origin, if possible. Calculate age of material. Label two empty plates with your initials, the date, specimen (milk), aliquot volume (0.1 or 1.0 mL) and dilution factor (10^2).Prepare dilution blank: Add 9.9 mL sterile dH2O to a sterile 16x150mm test tube. Add the aliquots: Using a 2.0 mL pipet, pipet 0.1 mL into first plate, 1.0 into the second. Add melted agar (dry off if maintained in hot water) to each plate in turn, swirl to mix completely. Plunge the emptied tube immediately into warm water before agar solidifies to ease cleansing. When the agar is solid, invert the plate and incubate 35C for 48 hr. wash tub with warm water in it. Be sure to have enough tubes of SPCA (at least 3 tubes/person if they work in pairs on both experiments). 5) invert and incubate to develop colonies. Each colony represents a “colony forming unit” (CFU). For optimum accuracy of a count, the preferred range for total CFU/plate is between 30 to 300 colonies/plate. One disadvantage of pour plates is that embedded colonies will be much smaller than those which happen to be on the surface, and must be carefully scored so that none are overlooked. Also, obligate aerobes may grow poorly if deeply imbedded in the agar. Construct a table in your notebook with a line for each plate: • the identity/source of the specimen (notebook entries should be detailed). Label the bottom of the empty, sterile plates your initials, seat number, date and the above data. 2. Dilute specimen to yield approximately 30 to 300 CFU per aliquot to be plated (from 1). 4. Pour 15 mL of melted Plate Count Agar (45C) into the inoculated petri dish. 5. Cover and mix thoroughly by gentle tilting and swirling the dish. Do not slop the agar over the edge of the petri dish. 7. Invert and incubate at 37 C for 24-48 hours. Count all colonies (note that the embedded colonies will be much smaller than those which happen to form on the surface). A magnifying colony counter can aid in counting small embedded colonies. Record the data. Calculate CFU/mL or CFU/g. Enter results in your table. * For 600 mL of NA + 1% glu: 9 g agar, 4.8 g nutrient broth, 6 g dextrose. Dissolve ingredients at 95C, repipet into 16 x 150 mm tubes, cap, autoclave, 15 lb, 15 min. Cool to 45C before using. Plate Count Agar may also be used. Ground beef to be tested. Have date of origin, if possible. Calculate age of material. Sterile dH2O in 4 repipets capable of adjustment to deliver 1 to 10 mL aliquots. Clean sterile petri dishes, 3 per student. Repipet 9.0 mL sterile dH2O into each of the three tubes. After thorough suspension, add an additional 7.0 mL more sterile dH2O. Vortex to mix well again. 3) Use a fresh 2.0 mL pipet to deliver first 1.0 ml of 102 into the appropriately marked empty plate, then deliver the rest (1.0 mL) into 103 dilution tube, vortex. After the plate has completely solidified (be patient), invert plate and incubate 35 C for 48 hr. The contents of the other dilution tubes may be washed down with hot soapy water. Count the colonies on the plates and calculate CFU per mL. Remember that colonies imbedded within the agar are quite small, while the colonies on the surface are quite large (see the image to the left). Each counts as a colony when enumerating the total colonies formed. 2 If testing for E coli H7:O157, substitute MacConkey Broth for sterile water in this step. After dilutions are completed, place suspension in 37oC.